I love fall! I especially love fall recipes – pumpkin and apples and cinnamon, oh my! But it can also be a time of year when you need to take something delicious to a gathering at church, work, a potluck dinner, or to a family gathering. Sometimes we automatically know what dish we’ll take because there is one that’s our specialty. But sometimes we need or want something different – or we haven’t found our specialty yet. 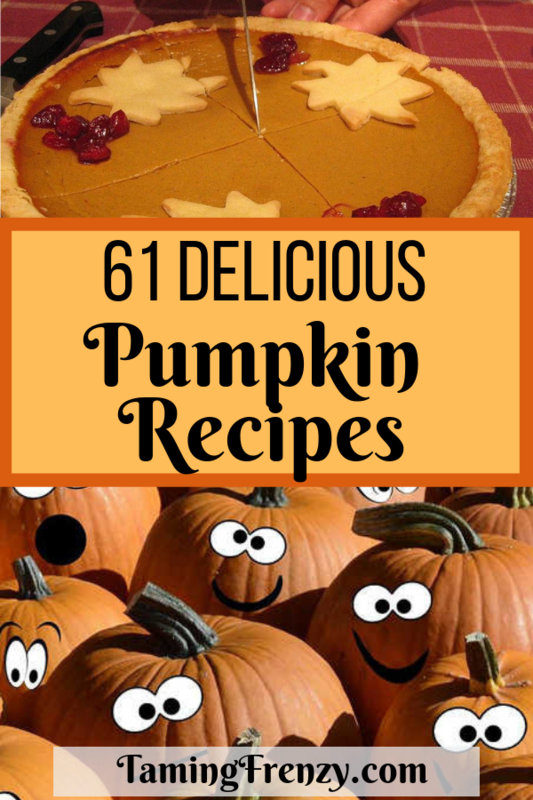 This list of 61 yummy pumpkin recipes is bound to have something that could become your signature dish! If you like this article or know others who would enjoy the collection of recipes please share this with your friends on Facebook or pin it to your favorite Pinterest board. I’d also love to have you sign up for the weekly newsletter. You’ll get links to what’s new on the blog and other content that’s not posted here. What you won’t get is a crowded inbox. Previous Post: « Embarrassed to Ask Your Doctor About These Hysterectomy Concerns? I love all those little pumpkin eyes all representing a wonderful pumpkin recipe. I am a fan of all the spices that go into many of the recipes. Just the aroma of them is enough to set me on an eating spree.